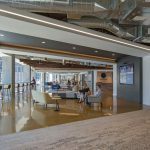 In late 2016, Howell Construction was awarded the 30,000 square-foot tenant finish at the 1601 Wewatta Street building based on a CM/GC proposal for Agility Recovery, Inc. Howell worked intently with Interior Architects and CBRE through the design schedule, delivering design progress milestone budgets. Ultimately, Howell’s preconstruction manager provided the team with cost data for the base scope of work and alternates in preparing the guaranteed maximum price. 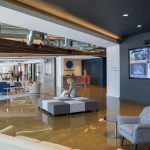 This 1st generation space was built in an accelerated timeframe consisting of a 13-week construction schedule. 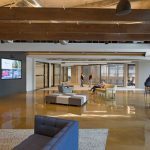 The tenant finish scope of work consisted of a CEO office, private office space, huddle rooms, open office space, training rooms, breakrooms/bar areas, conference rooms, a library, and an MDF room. 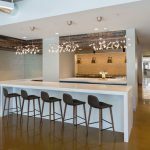 Agility Recovery moved into a spectacularly designed space with high-end finishes, including custom millwork, wood paneling, specialty ceilings, stained/polished concrete floors, and DIRTT wall partitions. 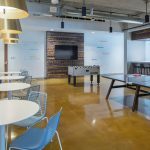 This modern space provided employees with areas that fuel collaboration and promote company culture.